Sunêlia Confort 6/8 pers. 3 bdrms. Aluna Holiday camping is an outdoor hotel 5 stars that has all the solutions adapted to the needs of holidaymakers and tourists. That we come in family, couples, solo or with a group of friends, there is always comfortable shelters that can accommodate everyone. This large mobile home of 34 m2 is part of the categories of accommodation of the campsite which are available for groups or large families. They have a capacity of 6 to 8 individuals at the same time. 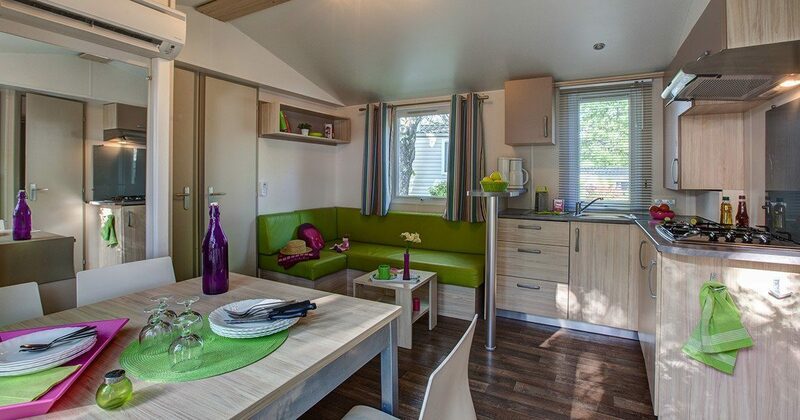 Large mobile home of 32 m2 comprises a total of three rooms. The first piece is a large master bedroom with a large double bed. The other two parts are the rooms with two beds each. This rental is also provided with a living room with possibility of two beds because the bench which is convertible. So everyone can find to rest and chat after days hectic in the campsite or outside the campsite. It also has a dining area so that everyone can eat together. For cooking, tenants have at their disposal an equipped kitchenette. It is equipped with different kinds of appliances to prepare, but also to cook the food. Kitchen utensils, kitchen background and a lot of dishes are also set to serve residents. With respect to the water of this mobile home room, it is large. It includes a shower and a sink. The toilet is separate. The mobile home is equipped with a heating. Even in winter, we won't have to be cold inside. It is also equipped with air conditioning. In the summer, they choke nor heat. There is also a safe. If you travel with a large sum of cash or valuable objects, or even if you have jewelry that you do not want to wear all the time, we can lock them in the safe. As users will be the only ones with keys to opening, we won't get stolen. It should be noted that in this mobile home, we can also accommodate a pet. However, it cannot accommodate dogs category 1 or category 2. For other animals, should be 6 euros per night. To help vacationers and tourists who travel light and who don't take with them too much business, the campsite offers various houses linen rentals. For example, it is possible to rent sheets or towels. You can also proceed beforehand with the booking of an end of stay cleaning. For information about all these offers and benefits or about the facilities that are available in the mobile home, we can go to the service desk. It is possible to call them directly or send them e-mail messages. towel rentals and reserve the end of the stay cleaning. The configuration within the same categories of mobile home can vary by model. 20% discount! For every stay in an accommodation or on a pitch as from 14 nights, from 05/04/2019 to 26/06/2019 and from 31/08/2019 to 04/11/2019. For all stays in accommodations or on pitches as from 14 nights, from 05/04/2019 to 26/06/2019 and from 31/08/2019 to 04/11/2019. For payment by instalments without any extra fees, don't hesitate to contact our hostesses for more information. The perfect way to start your holiday serenely! for every stay of at least 7 nights. As from the subscription of the rental contract. Enjoy the benefits of the card in 28 campsite destinations.